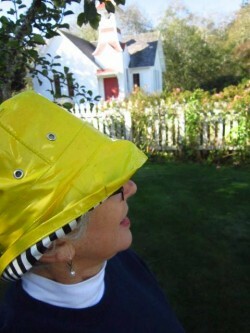 Yesterday was a Yellow Rain Hat Day here at the beach. It was the first time in ages, and it felt good. It seemed forever ago since I had wakened to that familiar pitter-patter on the roof and the banging of a loose something-or-other out by the garden shed. As much as I cherish the sunshine (and miss it from my California years), rain with a bit of wind feels more like Oysterville. The change from the 83° on our porch of a few days ago to rain with a bit of chill in the air wasn’t a surprise. It’s not only our techno-ability to get a weather forecast at the touch of a keyboard that told us the rain was coming. Those of us who have been around a while recognize a ‘weather breeder’ when it arrives. And Monday was definitely one of those! It was an unseasonably warm, windless, beautifully clear sunny day. It didn’t take a trained meteorologist to predict a change. I was glad for the rain and glad for a chance to clap that yellow hat on my head in celebration. 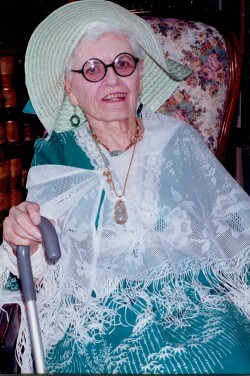 My mom, “The Queen of Hats” gave it to me twenty years or so ago. It was not the first hat she had given me in my lifetime, but it was the last. Not only that, it is the only hat that I have ever really liked. As much as I loved my mom, and as much as people say I remind them of her, our interest in clothes – from hats to shoes – couldn’t have been more opposite. To her, every outfit was a “costume”; to me, clothes are more like a socially required necessity. The yellow hat is the perfect answer to both mandates. It gets lots of compliments, fashion-statement-wise, and it serves several practical purposes – it hides my humidity-challenged hair and protects me from the onslaught of Northwest ‘precip,’ from drizzle to downpour. Hooray for rain and for my yellow hat and for my mom! I like hats and am determined to wear them more often! Hummmm….in anticipation of some much hoped for ‘precip’ in parched Northern California I will search for my own rain hat…have not worn it for what seems like eons.